Like a lot of people, I've always been intrigued by how and why Europe - which for most of history comprised a few backwater dukedoms in an extension of the Western side of the Asian continent - could suddenly rise to dominate the world. This author's answer to this question is that, beginning in the early Renaissance, Europeans developed a few, key military innovations that kickstarted an (ongoing) technological revolution. According to the author, the process went something like this:1. Improved cannon technology made castles obsolete. 2. In response, Italian engineers created a better type of fortress, the trace italienne. 3. This improved type of fortification changed the nature of continental warfare because larger and larger armies were required to subdue them. 4. At the same time, these larger armies began using musketry volleys to great effect, while on sea broadside attacks using improved cannon ushered in a new era of naval warfare. 5. The high level of organization that these massive armies and navies required encouraged the growth of centralized bureaucracy, leading to the modern European nation-states as we know them. Overall, I felt that the author had a tendency to lose the forest for the trees; over and over again he seemed to get distracted by his own examples to the extent that his thesis seemed a little forgotten. Whole chapters - particularly chapter 2 - seemed to be mainly historical fact after historical fact, with little reference to his central argument. In addition, he doesn't really discuss why these technologies developed in Europe in the first place, so the central question above remains largely unanswered. Probably realizing this, near the end of the book he (somewhat hastily) suggests the following two reasons:1. Early modern Europeans thought of warfare as a means to conquer land, whereas other contemporaneous cultures thought of warfare as a way to conquer their enemies and make them slaves. Thus, Europeans had no compunction about killing their enemies in battle, while people in the rest of the world hesitated to do so, since they would be killing potential slaves. 2. The intense military competition between the embryonic European states created a technological arms race (but didn't people compete militarily in other parts of the world?). I'm no historian, but these reasons seem to provoke more questions than they answer. Still, this book is worth reading for the interesting historical facts it recounts as well as for its copious notes. In 1984, historian Geoffrey Parker delivered the Lee Knowles Lectures at Trinity College, Cambridge that expanded on historian Michael Roberts’ original argument that gunpowder stimulated a “military revolution” in Europe between 1560 and 1660. 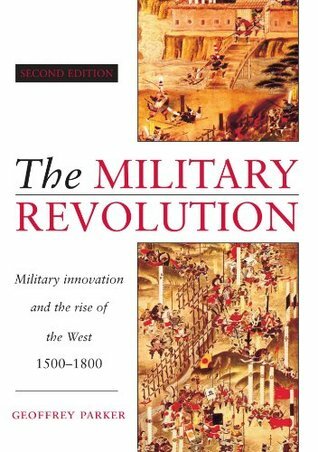 Now entering its second edition, The Military Revolution boasts a new afterword that defends the two original theses that a ‘military revolution’ emphatically occurred during the sixteenth-century, and that its technical components—the capital ship, infantry firepower, and the artillery fortress—bestowed decisive military advantage upon Europeans and made possible the ‘Rise of the West.’	Paker proceeds chronologically and thematically, beginning with an overview of the three components of the military revolution: the introduction of artillery, the development of the artillery fortress (trace italienne), and the mobilization of larger field armies. Parker suggests that Europeans adopted artillery to overcome the stalemate between offense and defense that, for centuries, favored the latter. Parker envisions qualitative and quantitative improvements in field artillery subsequently provoking another stalemate with the transformation in fortification construction: replacing vertical fortifications with shorter, thicker ramparts that withstood cannon shot and maximized counter-battery fire. Simultaneously, a revolution in field warfare occurred as armies replaced frontal assaults and hand-to-hand combat with projectile-based tactics (artillery, hand guns, bows). New weapons catalyzed the tactical innovation of new formations to maximize firepower, while also supplanting the mounted knight and pike formation. These first two components—the revolution in fortifications and the composition and tactics of armies—precipitated the final component, larger field armies. Yet larger armies did not achieve decisive victory for states. Ironically, the increasing size of armies and the proliferation of artillery fortresses precluded a “decisive campaign” within Europe for several centuries, and many states resorted to der kliene kriege that used small sapper units to capture strategic objectives. From the sixteenth century onward, the military revolution provoked two parallel developments: the first in how European states financed and supplied massive armies and the second in European naval warfare. First, Parker opines that expensive armies compelled states to reorganize their economic and bureaucratic capacity to achieve three goals: mobilize manpower, prevent desertion, and supply the army. States mobilized manpower by mustering volunteers and conscripts. States particularly sought veterans who brought considerable combat experience to an otherwise untested army. Volunteers were forthcoming, but limited. Hence, states also utilized the indelningsverk, or parish allocation system of manpower quotas. While mobilizing a heterogeneous army was one problem, states also had to keep men in the field, and thus incentivized soldiers with promises of storm-pay, shared ransom, and pillage. A “system of military devolution” emerged on the tactical level as states increasingly deferred logistics to both independent contractors and to soldiers who systematically exploited the land by extorting fire-money (protection rent) and strained the “contributions system” to acquire clothing, lodging, and victuals. If private coffers ran dry, the state offered guarantees of demand for horses, firearms, or clothing that pulled innovation from the market. Finally, Parker sees European states breaking the continental military stalemate through naval power. Parker advances two claims about naval development. First, he argues that European interstate competition on land facilitated the evolution of naval fleets from galleys to the capital warship. Second, Parker contends that Europe’s sophisticated navy, coupled with firearms, secured for them 35% of the earth before the industrial revolution. Europeans enjoyed decisive military advantages in Africa and the Americas because the indigenous populations lacked comparable tactics and firepower. Pre-1800 imperial expansion stemmed both from decisive tactical and technological advantages and the failure of European opponents to innovate corresponding technology and tactics—rival empires, like the Ottomans, lacked the military order, discipline, and technique to match European rates of fire. However, Parker concludes that until the Industrial Revolution, Europeans would lack the appropriate combination of naval and land force to completely open trade in East Asia. Parker may be criticized for his insistence on military superiority as the determining factor in European global expansion. It’s unclear how Parker weighs military superiority relative to other possible factors promoting European expansion. Did the Aztec Empire collapse because it lacked “defensible bases” against Spanish artillery? Certainly, European diseases and Aztec political instability, and Spanish gunpowder, impelled the Aztec collapse. Parker’s focus on military force pulls non-Europeans into the narrative mostly during their miserable encounters with a superior European military. While his thesis accommodates culture, it does not thoroughly analyze how factors other than military superiority aided the ‘Rise of the West.’ Nevertheless, Parker offers a compelling explanation of European ascendancy between 1500 and 1800. To put it simply, Geoffrey Parker takes a cultural and technological approach when interpreting military history from 1500-1800. Cultural when he distinguishes reasons why the rise of the West was due to a few cultural superiority aspects. One case is that the Muslim way of war was traditional and did not allow for tactical revolutions that the West was capable of. Technological when he states that the development of fortresses heavily changed the way war was conducted. Overall, for the brevity of the read, I believe that its worth your time if you are interested in military revolutions that impacted the way war was conducted in the past. Furthermore, I believe this book lays out interesting concepts that could be used in military research and interpretations. However, I wouldn't recommend this to readers who are not interested in medieval history. But if you don't mind that fact, Military Revolution by Geoffrey Parker is a solid read. A very broad history, that provides a useful overview of the impact that guns had on tactics and the balance of power in Europe (and around the world) after 1500. I especially appreciate the extensive use of photographs and pictures to demonstrate his points, and his attempts to broaden his history beyond a simple look at Europe. At times the book is overly simplistic in its explanations, but that is to be expected in such a short, broad overview. One explanation of Europe's dramatic rise from backwater to world-wide influence in a few short centuriesAn important work reevaluating the change technology and resulting tactics played in the military - and therefore political and economic - history of the world as Europe rose from a relative backwater to project power and influence around the globe. 3.5/5 stars This reads far too much like the text book that it was for me. I prefer the writers who can disguise their text book stuff behind a thin veil of awesome. Very informative book, just very dry. Interesting read. He does fall into the trap of assuming that medieval armies were almost entirely cavalry because that's what received the most attention in writing, though. Colorful account of the rise of Western military strength. Its conclusions have been contested, but the breadth of scholarship is impressive. Absolutely fascinating work. Essentially a primer on how warfare came to be the way it was for the periods of time that I tend to read the most about. Geoffrey Parker - Geoffrey Parker is Andreas Dorpalen Professor of European History and an Associate of the Mershon Center at The Ohio State University. He has published widely on the social, political and military history of early modern Europe, and in 2012 the Royal Dutch Academy recognized these achievements by awarding him its biennial Heineken Foundation Prize for History, open to scholars in any field, and any period, from any country.Parker has written or co-written thirty-nine books, including The Military Revolution: Military innovation and the rise of the West, 1500-1800 (Cambridge University Press, 1988), winner of the 'best book prize' from both the American Military Institute and the Society for the History of Technology; The Grand Strategy of Philip II (Yale University Press, 1998), which won the Samuel Eliot Morison Prize from the Society of Military History; and Global Crisis: War, Climate Change and Catastrophe in the Seventeenth Century (Yale University Press, 2013), which won the Society of Military History’s Distinguished Book Prize and also one of the three medals awarded in 2014 by the British Academy for ‘a landmark academic achievement… which has transformed understanding of a particular subject’. Before moving to Ohio State in 1997, Parker taught at Cambridge and St Andrews universities in Britain, at the University of British Columbia in Canada, and at Illinois and Yale Universities in the United States, teaching courses on the Reformation, European history and military history at both undergraduate and graduate levels. He has directed or co-directed over thirty Doctoral Dissertations to completion, as well as several undergraduate theses. In 2006 he won an OSU Alumni Distinguished Teaching Award.He lives in Columbus, Ohio, and has four children. In 1987 he was diagnosed as having Multiple Sclerosis. His latest book is Imprudent King: A New Life of Philip II (Yale University Press, 2014).